St. Croix is truly blessed to have a LOT of excellent restaurants. Ranging from 5 Wine Spectator Award winning restaurants to fast food joints, and everything in between. We really have it all. We have listed many of our favorite restaurants below. This is by no means a complete list as we can't eat out 3 meals a day, but it does represent many of the ones we know and love. We strongly advise checking a restaurant's website or Facebook page to make sure of their operating hours and other changes that are just too many for us to keep up with. This is especially true during summer and fall months. If you're diving with us (and why else would you be on this wetsite?) our crew will be happy to tell you about their favorites and steer towards various nightly specials that they know about. balter delivers the perfect combination of simple elegance. With fresh, locally sourced ingredients, creatively composed by award-winning chef Digby Stridiron, one-of-a-kind cocktails & wines selected by Sommelier Patrick Kralik, and unparalleled service, balter is the new standard when it comes to Crucian hospitality. 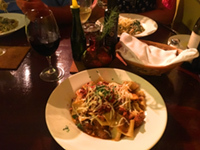 A cozy, urban, multi-award-winning Christiansted restaurant focusing on simply great food. They have a passion for sustainability and focus on locally sourced, fresh ingredients to bring the best food to the table, supporting the local island community. Dining at the Beach Side Café is truly an extraordinary experience. Lunches are casual, breezy, and scrumptious, and dinner is simply a magical moment wrapped up into a perfect evening. The Iguana Lounge features daily Happy Hour specials and small plates to accompany your favorite cocktail. Galangal specializes in French Asian Fusion Cuisine. Their bar features hand-crafted cocktails and an extensive wine list. Hospital Street in Christiansted about a block east of the Fort. Savant’s menu is eclectic with iconic house favorites. They buy fresh fish and lobster daily off the boats from the local fishermen. The fresh fish has three preparations on the menu, is incorporated with curries, enchiladas, fajitas and with our daily specials. We focus on farm-to-table incorporating local produce from island farmers–spicy mixed greens, tomatoes, cucumbers, edible flowers, and herbs all combine to create healthy, fresh and delectable dishes. A creative American Caribbean restaurant tucked away in the Royal Strand building in Christiansted, right around the corner from SCUBA; Our food, cocktails, wine list and playlists are slightly refined however not pretentious. Holger Dankse Hotel right on the Boardwalk. Breakfast, lunch, and dinner 7 days a week. They have a bottomless champagne Sunday brunch. Live music a couple of night a week. In Apothecary Hall on Company Street in Christiansted. Specializing in homemade French-Inspired cuisines, using local products. In Coakley Bay Condominiums about 20 minutes east of Christiansted. Right outside of SCUBA back door in the Caravelle Arcade in Christiansted. A new waterfront bar and restaurant on the west shore with an awesome view. Right on Strand Street near the corner of Fisher street. Tacos, nachos, burgers, salads, Sunday brunch and more. Right on the Christiansted Boardwalk. The same great people who run 40 Strand and Toast have now opened The Mill, a boardwalk bar with brick oven pizza. Open for breakfast, lunch, and dinner every day plus Sunday Brunch. There's also the attached Deck Bar serving light bites and great drinks with a wonderful view. Right on the Boardwalk at the Caravelle Hotel in Christiansted. This is where you'll find the SCUBA crew a LOT. Our boat docks right in front of the hotel. Hand made pastas, pizza and traditional Italian fare, classic dishes as well as fresh fish and lobster. Thoughtful wine list with many by the glass and full bar. One of our very favorite local restaurants. They're only open three nights a week but it's worth the drive to Frederiksted to try their local and latin cuisine. They've been in business for 60 years!